Great confidence booster with arms free for splashing and playing - my son has no complaints with this unlike the various rings and armbands I have tried. The age 1-3 was a little on the big side for my one year old but an acceptable niggle given the wear we will get from the jacket. I think it is important to point out that there are two floats in each pocket and the removal of floats gives the extra room for a growing child as well as adjusting buoyancy. 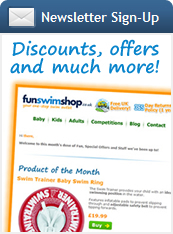 This learn to swim swim jacket is not suitable for absolute beginners, it works best for children that are fairly water confident. As the buoyancy is around the body it will help put the child in a horizontal swimming position with the face tilted forward. The Splash About Kids Swimming Float & Buoyancy Jacket has just about everything, warmth, buoyancy and protection from the sun. The Splash About swim jacket is a buoyancy swim vest made of soft, flexible neoprene with 16 easy to use internal, removable floats. This Splash About float jacket will keep your child warm, afloat and sun protected. 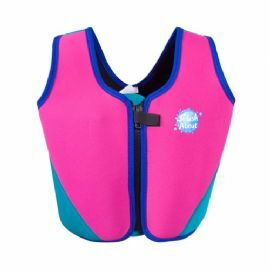 This swim vest is also fully bound with tough nylon coating and a YKK zip - it really is a kids float jacket made to last.